Sometimes we act as if sins are just black marks against us in God’s ledger, debits against our rewards account. But the gospel story of the paralytic (Mark 2:1-12) should wake us up to the real nature of sin. For sin is more than a demerit–it is distancing of a person from God, who happens to be our source of life and energy. God’s Holy Spirit is the force that must be with us if we are to have life and strength and vigor. Sin is always a result of a decision. Original Sin, flowing from the tragic decision of Adam and Eve, causes us to inherit a weakened humanity, which from the moment of conception, is distanced from God. Actual sin results from each person’s own decisions. Some decisions can cut us off entirely from the source of divine life. We call these decisions mortal. Some decisions don’t snuff out divine life, but rather weaken it. Such sins are called venial. But whether original or actual, mortal or venial, sin always drains the life right out of us. As we walk away from God, we grow spiritually weaker and weaker till we come to the point that we no longer have the strength to walk back home to our Father. When Jesus returned to Capernaum after his first mission trip, people flocked to him. But a paralyzed man couldn’t join the throng–he just lay there watching people pass him by. Until, that is, some of his friends cared enough to pick him up and bring him to Jesus. But then they encountered a problem–the crowd was so thick that they could not get their friend through the door. They could have consoled themselves that they tried, and then brought the poor man home. But they were more determined than that. They hoisted him up on the roof, opened a hole in the thatch, and lowered him down. The gospel of Mark makes a curious comment at this point. 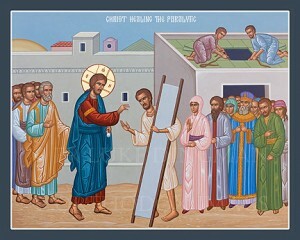 “Seeing their faith,” it says, Jesus turns to the paralyzed man and tells him that his sins are forgiven. First of all, note that faith is something that should be visible. The four stretcher carriers believed that Jesus was, at the very least, a mighty man of God who could help their friend. But this belief manifested itself in resolute, persistent, conspicuous action. And of course this faith was united with charity, since they had gone to such great lengths not for themselves but for their unfortunate friend. Notice, however, that it was not the paralyzed man’s faith that prompted Jesus’ decision to forgive his sin. It was the faith of his friends. Perhaps his physical paralysis was a sign of utter spiritual paralysis–maybe he had not the strength to make a positive act of faith. So his friends’ faith stood in proxy for his own. That’s exactly why infant baptism has always been practiced in the Church from the beginning–the faith of parents, godparents, and the whole church stand in proxy for the infant who is incapable of faith. The most deadly paralysis is the paralysis of sin. But when the Pharisees object to Jesus authority to heal this malady, to wipe out his past and give him a brand new start (Is 43:18-25), Jesus demonstrates his competence by healing the physical disease as well. Jesus does not say “yes” to our spiritual needs and say “no” to our earthly needs (2 Cor 1:18-22). He created us body and soul and desires that we have fullness of life, in every department, and that we have it abundantly (John 10:10). So a tormented man, who had to be carried to Jesus, walked away bearing his own stretcher and free as a lark. It would never have happened, though, if his faith-filled friends had not cared enough to risk ridicule and disappointment to bring him to Jesus. So when’s the last time you invited someone to church?